Gossimer, one of the most popular domain name registration and web hosting company has announced yet another .COM, .Net, .Biz and .Org domain promotion. The promotion is on transfer-in domains as well as on domain renewals. One of the most popular web hosting and domain name registration companies Gossimer has announced a special promotion on .COM, .Net, .Biz or .Org domain transfer. 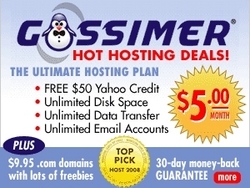 Under this promotion, all the .COM, .Net, .Biz and .Org domains transferred to Gossimer from outside will be priced at $8.59/year. The promotion is applicable on all .COM, .Net, .Biz and .Org domains. The regular price of .COM, .Net, .Biz and .Org domain name in the industry is around $10, but under this offer a special price of $8.59 is set for the .COM, .Net, .Biz and .Org domains transferred to Gossimer. With this promotion Gossimer has taken one more step towards lowering the entry barrier for newbie webmasters. With every domain transferred to Gossimer, the company offers many free services. It gives free personalized (you@yourdomainname.com) e-mail account with 2 GB free space, and fraud, spam, and virus protection. Along with that you also got Unlimited Mail Forwards, domain forwarding, privacy protection, DNS management, chat and collaboration tool, domain theft protection, bulk tools, and an easy-to-use control panel. Of late, Gossimer has been chosen to be one among the top 25 most popular domain name registration and web hosting company by Domains Directory for the months of May and June. Domains Directory has also interviewed Marvin Dreyer, CEO, of Gossimer. The interview has been published the Marvin’s interview on Domains Directory website below company’s profile. Gossimer has gone a long way, since it left New Jersey and shifted its base to Melbourne, Florida. The company is on the growth trajectory, and the future seems bright for Gossimer and its customers.